Dark Matter in Our Galaxy -- How did the Universe begin? The Universe was born in the Big Bang 13.7 billion years ago. Since then, the Universe has expanded and formed the stars and galaxies, including the Sun and our own Milky Way. Gravitation, the force of attraction between massive objects even across cosmological distances, played a major role in shaping the universe and its history. However, more than 80% of the mass in the universe consists of "dark matter," a mysterious form of matter that has never been detected directly. If we could learn where dark matter resides and how it interacts with normal matter, such as stars, we could learn much about the origin of the Universe began and the way it acquired its current properties. 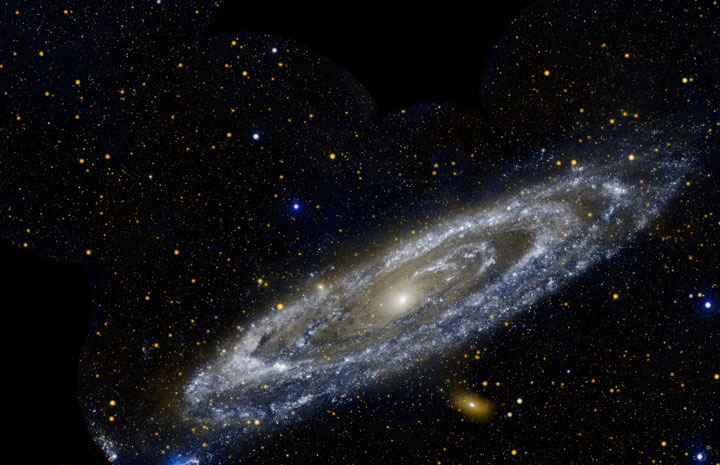 The Subaru Prime Focus Spectrograph (PFS) investigates the distribution and behavior of dark matter by measuring the motion of about one million stars in the Milky Way and Andromeda galaxies. The Subaru Telescope's wide field of view and capacity to perform spectroscopic measurements for 2,400 stars at a time will significantly increase our ability to study dark matter in galaxies, with important implictiona for all of cosmology.